If playing with dolls is the equivalent of wish fulfillment, then marrying a prince must be a wish come true. I, for one, never dreamed of marriage to anyone—neither prince, pauper, nor Indian chief (or should I say, Native American chief)—I always imagined I’d go it alone. When I did marry, I wore a simple white suit (jacket and skirt), and my one indulgence was a pair of really pretty sling-back shoes. As I exchanged my vows at the makeshift trailer in between traffic court hours (yes, the real courthouse was under construction and we were shuttled into a mobile home of sorts), I was embodying the notion of a no-frills union. No such turn of events for Kate Middleton, who is about to do the unimaginable. She is entering a cathedral a commoner, and emerging as a royal. 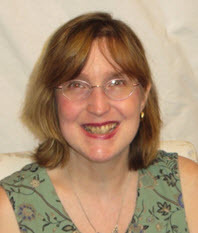 Quite the amazing feat: with a simple “I Do,” she is hurtling above barriers of social restrictions and cultural conceits. For those of us who are Americans, and who fancy “princes” and “princesses” as parts of fables and Disney cartoons, the overseas wedding is a slice of curiosity and a chance to rubberneck at how our European “cousins” live. It is an exhibition of pomp and pageantry that we just can’t equal here in the States. 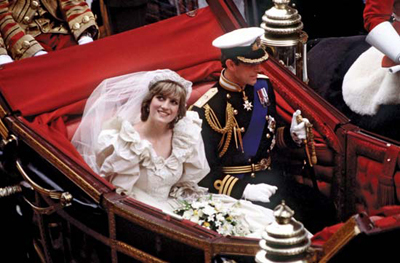 That is, if the royal wedding unfurls like that of Princess Diana and Prince Charles’s 1981 nuptials. With the benefit of hindsight, we now know that the “fairy tale” aspect of the Charles and Diana union was just that: a fairy tale. We’ve learned that theirs was a loveless union from the start, and the dewy-eyed bride and the stalwart groom were strangers as they entered the church, and remained estranged after they exited. Let’s hope such a fate doesn’t await Charles and Diana’s firstborn son, William. The life of Diana was a brief one (feel free to hum Elton John’s “Candle in the Wind” during this bit), but it certainly was a bright one. Before she died in a car crash that seemed to have been the result of a frenzied pack of paparazzi, Diana was a role model and a style icon. During the halcyon days of her wedding to Charles, there were tribute dolls on both sides of the Atlantic. However, when it became clear that her marriage was a sham—and the news of infidelity and betrayal broke—the doll market for Diana seemed to have dried up. However, when she spearheaded the auction of 79 of her haute couture gowns in a New York City charity auction, the opulence and the generosity were just too rich to ignore. 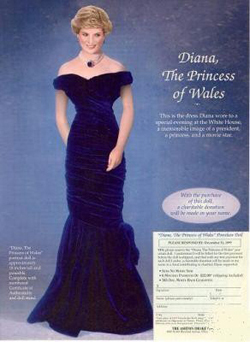 Some of her best-known ensembles were purchased by competing doll companies and collectibles firms, and a new reign of Diana Fashion Dolls was about to unfurl. However, tragedy lurked right around the corner for Di, and she lost her life a few months after the gowns were auctioned off. Her memory was immortalized and canonized by a spate of doll manufacturers: Franklin Mint, Ashton-Drake, Danbury Mint, GADCO, to name a few. The Ashton-Drake rendering of her “Travolta” finery was especially well received (pictured here). 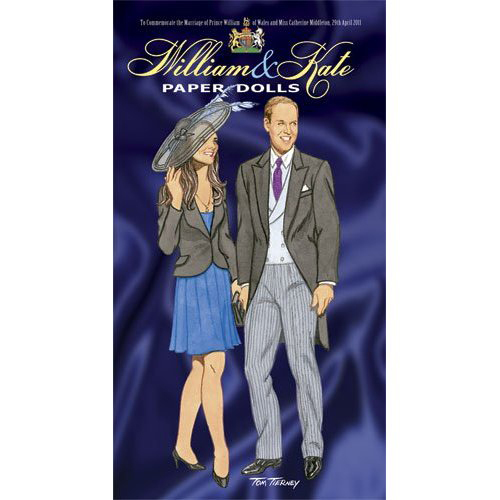 Now, with the patient Kate Middleton (dubbed “Waity Katie” by the British press for her persistence in getting engaged) about to become a royal figurehead, with a pretty face and a curvaceous figure, doll makers are once again rolling out the red carpet for her life as a doll. Paradise Galleries has an offering of the engagement ring, along with a doll clad in the dress Kate wore when the announcement was made (pictured here). Franklin Mint, Ashton-Drake and the Danbury Mint are also on hand to commemorate the transformation of a “regular gal” into a future princess, and quite honestly the online renderings are quite stunning. And we Americans are watching the fanfare, but perhaps not as enchanted or as enthralled as we were 30 years ago, in 1981. When we witnessed the Charles and Diana ceremony, we were a country of greater optimism, forward-thinking, proud, and in many ways naïve. After the massacres on 9/11, and the crumbling of the World Trade Center, the landscape of America was forever changed physically and spiritually. When the terrain shifted, our footing has never been quite the same. Here in America, the Kate-and-Will bandwagon is slowly picking up steam. 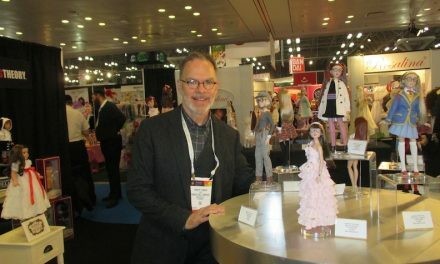 To that end, beautiful, meticulous paper dolls by the talented Tom Tierney are in place (he is the king of that domain) and a public sits by with credit cards in hand. All I can hope is that this tying of the knot, which is being lauded as the “wedding of the century,” is longer, happier, and more real than the wedding of the last century. If Kate and Will really want to start off their life together on a good note, I have a courthouse in New Jersey to recommend. And I can book them into a chamber in between traffic court. It worked for me; I hope it could work for them. NextA Date with Destiny: Groundhogs get more respect than dolls—what gives? 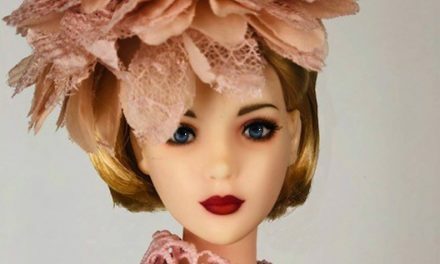 Living Dolls: Could Your Life Stand Up to the Doll Challenge?